5 Steps To Better Skin This Winter. | By Millie. 5 Steps To Better Skin This Winter. Pop it on your christmas list, or maybe treat yourself, but I can't tell you how much a skin cleansing device has helped the look and feel of my skin. 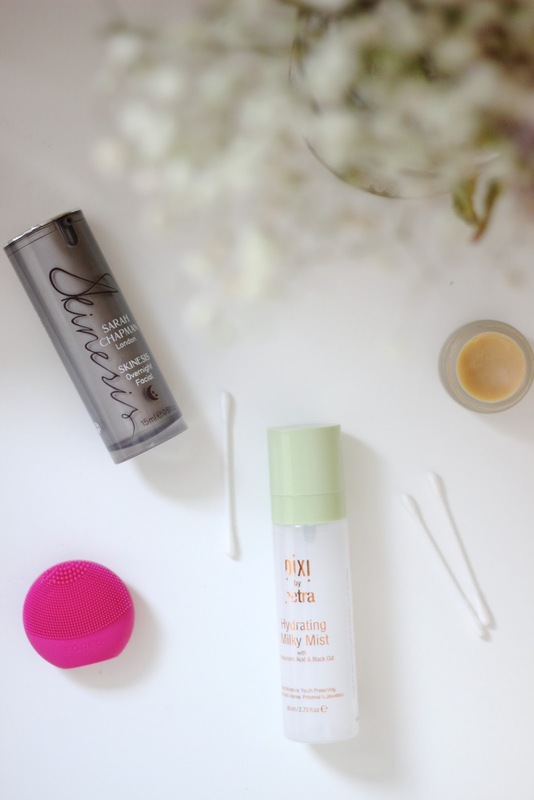 I used to use the Clarisonic which is great if you're skin isn't super sensitive, the bristles can feel a bit harsh but it's a really good way to get very soft, clean skin. Lately I've switched the the Foreo Luna Play which is a fraction cheaper and it does a very similar job, but feels a lot more gentle on the skin. These I love in the winter as they help offer a slight exfoliation, as well as a deep cleanse, to remove dead skin cells and better the surface of the skin. The Luna Play is a great one to start with as it's cheaper option and you can see how your skin reacts before splurging for its bigger sisters. We've all heard this a million and one times, but it's so so true. Having your daily intake of water can really benefit your skin. If you're dehydrated, you skin will suffer, simple as. 8 (big) glasses is the recommend amount, so please make sure you're hitting that, you will see a huge difference in your skin if you are! I find if I haven't drunk as much water as I should, I get dehydration lines and makeup will sit weird and it's just not good. Also getting your fruits and veggies in is another factor which will leave your skin glowing! I am a huge oil and serum advocate in the colder months, it's one of the only skincare items I will really invest in as they tend to last ages and make the most difference to your skin. If you haven't got round to picking one up yet, here's why ya should! Depending on which one you go for, they douse your skin in hydration, leaving it plumped and radiant by morning. There are a lot on the market these days, whether you need some anti-aging properties, or you lack radiance and moisture, there will be one you can get along with. I've been loving the Sarah Chapman Skineses Overnight Facial, it's a thicker oil than others I've used, but it feel amazing on the skin and it always leave it's feeling soft and looking nourished. As soon as winter hits, my lips all of sudden tern into a flakey mess. They get so dry and chapped that I need a lip balm - and a pretty intense one - on me at all times! The NUXE Rev De Miel is my all time favourite, you can really slather this on at night, or using it sparingly during the day to keep your lips plump. I can't tell you how good this balm is, it's the only thing that will save my lips during the winter! I always have on in my bag and on my bedside table, it doesn't leave my side. I love love love hydration mists to give my skin a little pick-me-up throughout the day. The Pixi Milky Hydration Mist is one I've been using and it does exactly what it says on the tin. The spray is very nice and lightweight so it wont clog the skin, or leave a funny residue. I use this in the mornings before moisturiser, and sometimes again after, to give my skin and extra boost of nourishment. This step is something I can't skip when it's cold! Starting a Blog: Tips I Wish I Followed. A Girlie Christmas Gift Guide. Autumn 5 Minute Makeup Drawer.